After Louis’ death, Georges made Louis Vuitton a worldwide corporation. Just a year after Louis died, Georges displayed Louis Vuitton at the 1893 World Fair in Chicago, Illinois. Georges continued to run Vuitton well as it spread internationally and his book “Le Voyage” [The Journey] was published in 1894.
nearing the turn of the century, Louis Vuitton put out its trademark canvas. The ‘Monogram Canvas’, as it came to be called is shown to the right, as it uses various symbols and the Louis Vuitton logo, LV. Georges then sailed to the United States, in which he toured various cities such as New York, Philadelphia, and Chicago. He sold Vuitton products during the visit. Georges exhibited Vuitton products at the maiden Paris Auto Show. 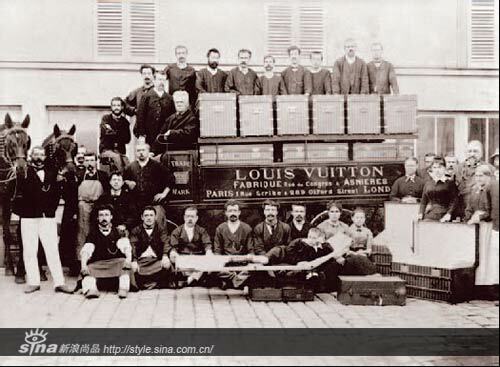 Georges Vuitton was given the honor to set up the “Travel Items and Leather Goods” section of the 1900 Paris World Fair. 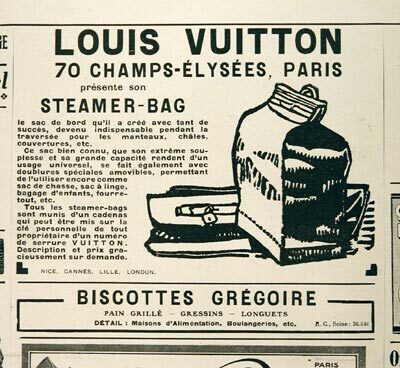 In 1901, the Louis Vuitton Company introduced the ‘Steamer Bag’, a small handbag to be kept inside Vuitton luggage trunks. Georges chaired the jury for the St. Louis World Fair. In the same year, the Louis Vuitton company introduced a new line of trunks that have special compartments for items such as perfumes, clothing, and other goods. Georges’ son Gaston-Louis married Renee Versille and Louis Vuitton introduces trunks for automobiles. the Louis Vuitton Building opens in Champs-Elysees. The building was the largest travel-goods store in the world at that time. Store locations open in New York, Bombay, Washington, London, Alexandria and Buenos Aires as World War I begins. only eight years after the end of World War I, the ‘Keepall’ is invented. This bag foreran the duffel bag in a travel bag for light travel to keep necessities in. the seventy-fifth anniversary of Louis Vuitton, a toiletry case is introduced specifically for opera singer Marthe Chenal. It could fit bottles, brushes, mirrors, powder boxes and more toiletries. Louis Vuitton introduced exotic bags such as a handbag of crocodile skin, as well as elephant hide handbags for the Colonial Exhibition. Louis Vuitton introduced the Nóe bag. This bag was made for champagne vinter to transport bottles. the Louis Vuitton Speedy bag was introduced. the golden age of Louis Vuitton ends as Georges Vuitton passes away. 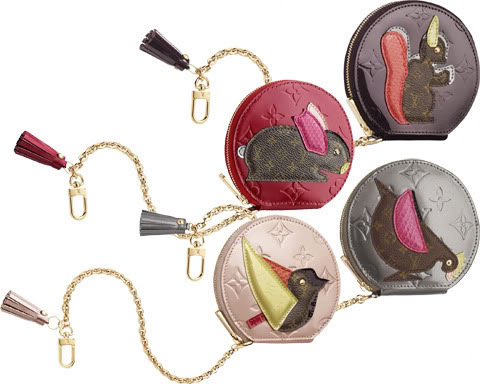 Estimates attribute Georges Vuitton with over 700 new Vuitton designs. Gaston-Louis Vuitton assumes control of the company. The secretary trunk is introduced for Leopold Stokowski, a conductor. World War II lasts from 1939 to 1945. Vuitton decides to go toward other industries instead of laying off workers in the post-war situation. 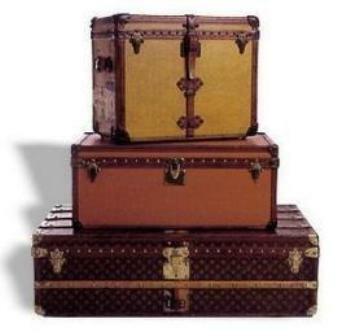 Louis Vuitton supplies all the travel items for President Auriol of France’s tour of America after World War II. new innovations in the treatment of canvas allow more bags to be made, and Louis Vuitton releases a set of Monogram canvas bags. 25 new models of travel items were introduced each year; a total of 175 new travel items introduced. a Louis Vuitton sales office opens in Toyko, Japan. In 1977, the Louis Vuitton SA holding company was created. Louis Vuitton stores open in Toyko and Osaka, Japan. Louis Vuitton teams up with the America’s Cup sailing race to form the Louis Vuitton Cup for Sailing. The Louis Vuitton Cup is an elimination round in which the winner sails against the America’s Cup winner from the previous year for the America’s Cup. the first store in South Korea opens in Seoul. the Epi Leather line is introduced. Louis Vuitton and Moet-Hennessey merge to form LVMH. The group continues to own the Louis Vuitton company and brand. See LVMH group for details. the Louis Vuitton Classic Annual Automobile Race is launched in Paris, France. a Louis Vuitton store opens in Beijing, China. LVMH launches the Taiga line, a luggage and briefcase black leather line for men. the centennial of the Monogram Canvas occurs and LVMH spotlights various designers. LVMH launches a line of pens. LVMH adds Marc Jacobs, who designs the Monogram Vernis line, and LVMH launches a line of travel guides to major cities around the world. In 2001, LVMH creates the Graffiti line and a Louis Vuitton charm bracelet is released. 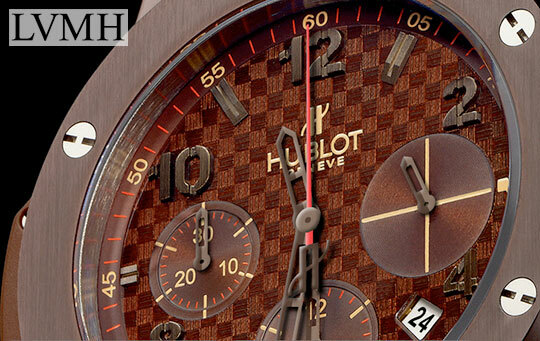 LVMH releases a Louis Vuitton line of watches. Takashi Murakami & Marc Jacobs launch the Cherry Blossom Limited Edition, Multicolor and Eye Love lines.